Crackmeters are used to monitor movement at joints and cracks in concrete structures or rock. 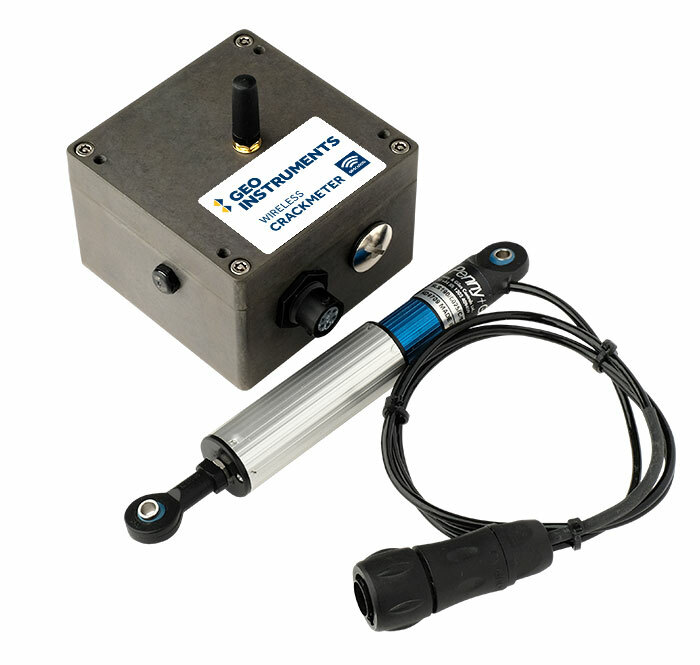 GeoCloud wireless crackmeters consist of a displacement sensor connected to GeoCloud crackmeter node. Monitoring joints to provide early warning of performance issues. Monitoring joints and cracks in structures that could be affected by nearby construction activities. Monitoring cracks in structures that have experienced seismic activity. Monitoring locations that are difficult to access. Internet or Local Access: The cellular gateway transmits measurements to the internet, where they can be accessed by an internet browser. The USB gateway provides on-site access via a tablet. Versatile Mounting Options: A variety of mounting options are available. Typically the crackmeter is installed between two anchors installed on opposite sides of a crack. Self-Configuring Communications: The GeoCloud nodes optimizes communication paths to the gateway automatically. This greatly improves reliability and power consumption when line of sight is not available or is blocked temporarily. Cable-Free: GeoCloud crackmeters provide their own power and transmit measurements by radio, entirely eliminating the cost of cables, cable protection, cable maintenance, and visits by a technician. GeoCloud Services: GeoCloud provides access to data wherever there is an internet connection. GeoCloud services operate 24 hours a day, processing measurements, checking for alarms, and generating graphs, reports, and alerts. Excitation for sensor: 2.5V, 100mA max. Resolution: 0.0015% of full scale. Noise Level: 0.005% of full scale.attery life: 4 to 5 years with data transmissions at 25-minute intervals. Environmental: IP68 at 2 m for 24 hours,-40°C to +85°C. Dimensions: 3.5 x 3.5 x 2.8 inches high, excluding antenna. Range: 1-inch. Other ranges available. Dimensions: 1.5 x 6 inch long.